Below are Box Office Collection report of bollywood film Badrinath Ki Dulhania With his review, budget and total box office collection status. Also including of the film. Badrinath Ki Dulhania movie lead star cast is Varun Dhawan, Alia Bhatt, Gauahar Khan. 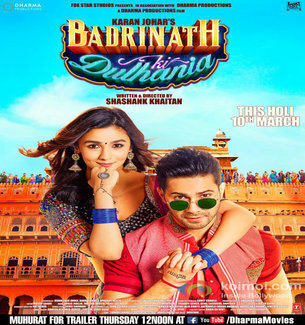 Badrinath Ki Dulhania is an indian drama, Romantic Film of 2017, directed by Shashank Khaitan & produced by Hiroo Johar, Karan Johar & Fox Star Studios. The movie was first announced on 3rd May 2016 with the release of online motion poster featuring Dhawan & Bhatt at a local village fair. Principal photography also began on same day. Some of the scenes were also shot at the Ghatotkach Circle, Kishore Sagar Lake & Seven Wonders Park in Kota, Rajasthan. Storyline: A man (Varun Dhawan) and woman (Alia Bhatt) fall in love despite their opposing views on gender and life in general.